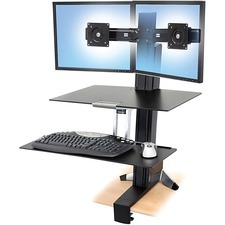 Ergotron WorkFit-S Display Stand - Up to 21.3" Screen Support - 25 lb Load Capacity - Flat Panel Display Type Supported27" Width - Desktop - Black - Welcome to TABS! Sit-stand workstation moves your keyboard and display in one simple motion to make computing comfortable for prolonged periods. Desktop workstation for dual monitors transforms any surface into a personalized, height-adjustable desk. Ergonomic design lets you change from a sitting position to a standing position effortlessly. Sit-stand workstation moves your keyboard and display in one simple motion to make computing comfortable for prolonged periods. Counterbalanced adjustment points allow instantaneous, tool-free re-positioning while you work. Full Product Specifications: Click to view Height: 35.7"